We're going to see if we can tie a string of blog posts with a series of connecting themes. Yesterday's post featured a statue of Mickey Mouse, so we continue that today with another statue of Mickey over in Toontown, at the back of Disneyland Park. 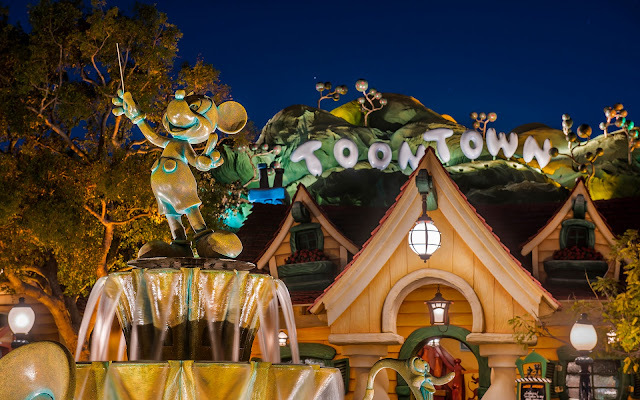 This Mickey stands atop a fountain that's also a band of sorts, and Mickey conducts a cacophony of "music" in a whimsical manner. Mickey's probably had better performances over the years--even in inclement weather. But he stands proudly on anyway, ever optimistic he can tune the instruments up to their proper key! Mickey Mouse atop a fountain of music.